Let’s review the basics: what is it, what are the benefits, and where else are megasites being built? A megasite is a tract of land that is prepared for constructing a cluster of businesses. Developers typically build in rural or suburban communities as opposed to urban areas, in proximity to schools, military bases, or other training grounds for attracting skilled workers. Megasites are often situated near major transportation hubs - rail, highway, airport, and/or port. Megasite projects may also include improvements to the local transportation infrastructure, literally paving the way for business or science parks, industrial complexes, or other such clusters to move in. One of the most famous megasites was developed in 1959 about two hundred miles east on US-64, the famed Research Triangle Park (RTP). Now one of the largest research parks in the world, it is home to more than 200 companies that employ some 50,000 workers. RTP continues to evolve, with a $50 million redevelopment plan that calls for 300,000 square feet of local retail outlets, food and beverage venues, and entertainment locales, along with public transportation - and possibly a commuter rail - under discussion. Here are some of the potential megasites planned or underway in central and eastern North Carolina and southern Virginia. 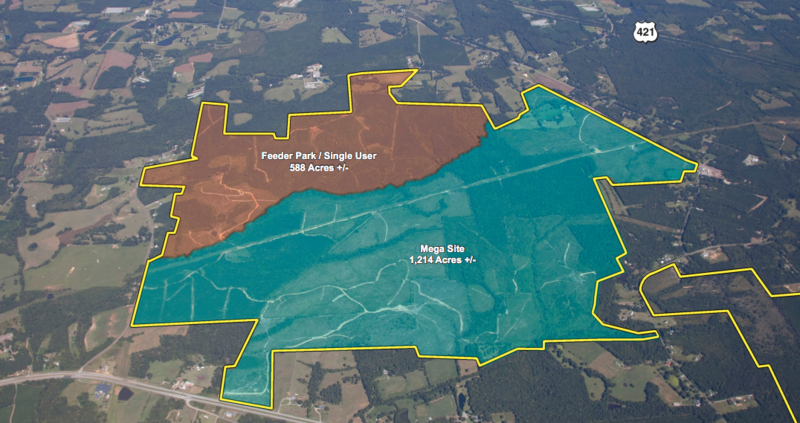 A 1,818-acre site purchased by Chatham County for $57.8 million. According to the website, "the site has direct access to a mile of Norfolk Southern Railway. Its strategic location is less than 50 miles from two international airports and within a five hour drive of four major East Coast port terminals. The site's proximity to Greensboro and Raleigh - including the globally-renowned Research Triangle - puts metro amenities and services close at hand." Billed as the largest shovel-ready megasite in the state, the Kingsboro Megasite is 1,449 acres in Edgecombe County, strategically located in the heart of the eastern seaboard, just off of US Highway 64, and 10 minutes east of Interstate I-95. Managed by the Greensboro-Randolph Megasite Foundation, headed by former Greensboro mayor Jim Melvin. More than 1,200 acres, expectations are to host multiple businesses and organizations. 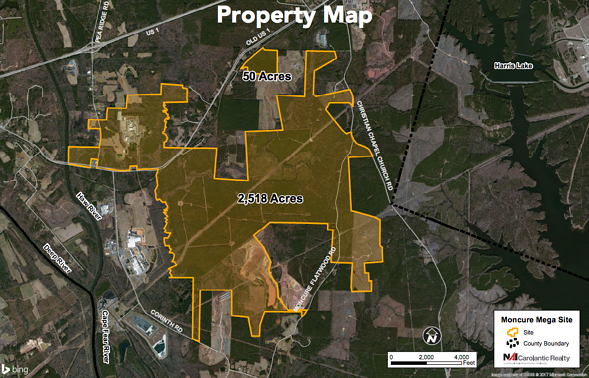 A nearly 1,500-acre site in southeastern Chatham County, adjacent to Lee and Wake counties includes an undeveloped site of more than 1,000 acres plus a 420-acre industrial site. 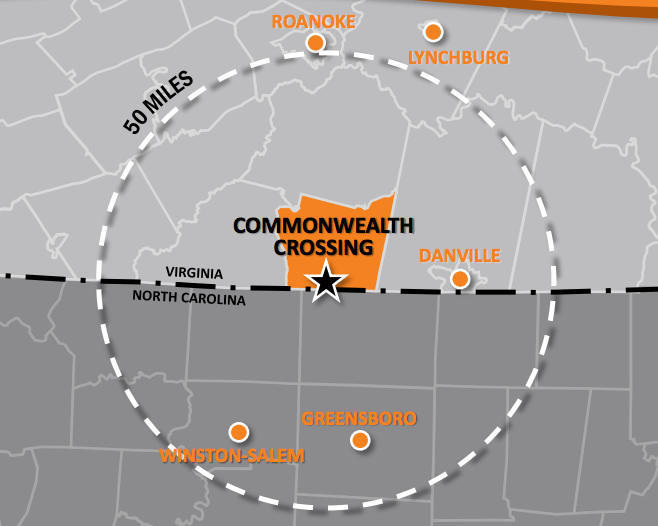 In collaboration with the Carolinas Gateway Partnership and the State of North Carolina, CSX announced Rocky Mount as the home of the Carolina Connector intermodal rail terminal (CCX). The $270M+ infrastructure project will position Nash and Edgecombe counties and Eastern North Carolina as a major logistics hub in the Southeast. CSX estimates that the truck-to-rail hub will create more than 1,500 jobs throughout the state over time. 3,528 acres of publicly owned land in Pittsylvania County, south central Virginia. Zoned for heavy industrial. 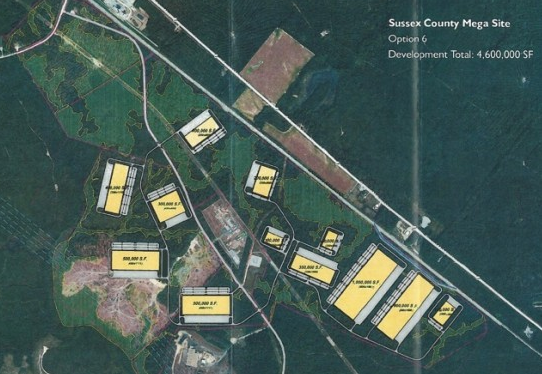 A 726-acre advanced manufacturing industrial park in Henry County, south central Virginia. 1,102 acres in Sussex County, features a quick 30-60 day timeline to prep site for construction, and has in place build-to-suit partners. 1,500 acres in Isle of Wight County, designed for light to moderate industrial uses, such as warehousing/distribution operations and technology-driven manufacturing. Several developers are now looking to Hampton Roads for siting potential megasites, in Moyock, NC and Chesapeake, VA. While many developers have a particular industry in mind, which dictates the size and scope of the development, these two potential megasites are using a more versatile model to attract a wider range of businesses and industries. In March of 2016, consultants presented a feasibility study for a 3,000-acre megasite in Currituck’s border community with Virginia. The initial report identified a strong potential market for a true mixed-use project featuring various housing, commercial, retail, office and industrial uses. As of August 2016, Phase II is underway and under contract. The new phase includes outlines for new zoning areas, roads and utilities. 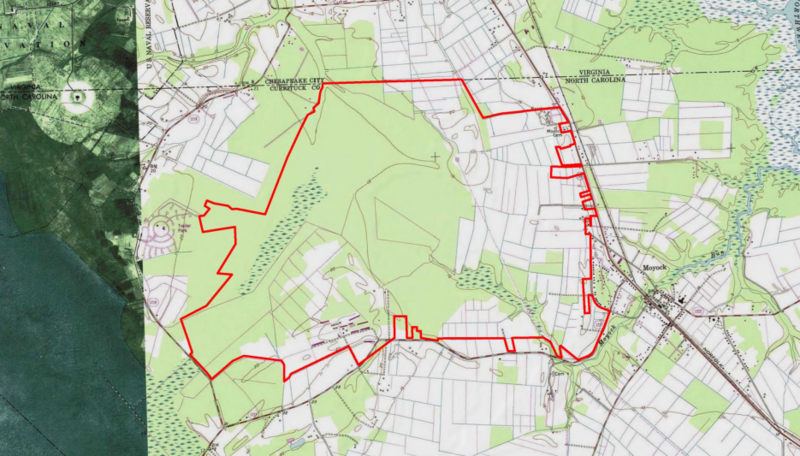 The City of Chesapeake announced its desire to develop 4,000 acres of farmland into a megasite in the southside of the city along the future I-87 corridor in January 2015. There appears to be a good deal of support for the idea, with all four delegates to the General Assembly voicing their support for the project as recently as May, 2016. UPDATE: City Council will vote in August 2017. Given the proximity to the vibrant Port of Virginia, a strong rail infrastructure, and access to major interstates, it is no wonder Hampton Roads is joining the other Virginia and North Carolina communities to consider siting potential megasites. These common sense developments can help turn underused land assets into vibrant economic centers for our region. Editor's Note: This article was originally published in Inside Business.